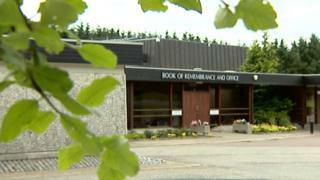 A memorial garden has emerged as the favoured option of families affected by the baby ashes scandal at Aberdeen's Hazlehead Crematorium. Baby and adult ashes were mixed together at Hazlehead and given back to relatives of the adult. A working group established to devise plans for a memorial for those affected has agreed that a memorial garden at Hazlehead Park should be created. It would contain a statue and seating, with planting designed to add colour and attract birds and butterflies. More detailed plans will now be drawn up. Aberdeen City Council is processing more than 200 claims for compensation relating to the baby ashes scandal.